Myrza, who is an editorial director at Summit Media and the former editor of Cosmopolitan Philippines and Marie Claire, moved into the studio when she was still single. It was enough space for one person, but it got quite cramped for two. 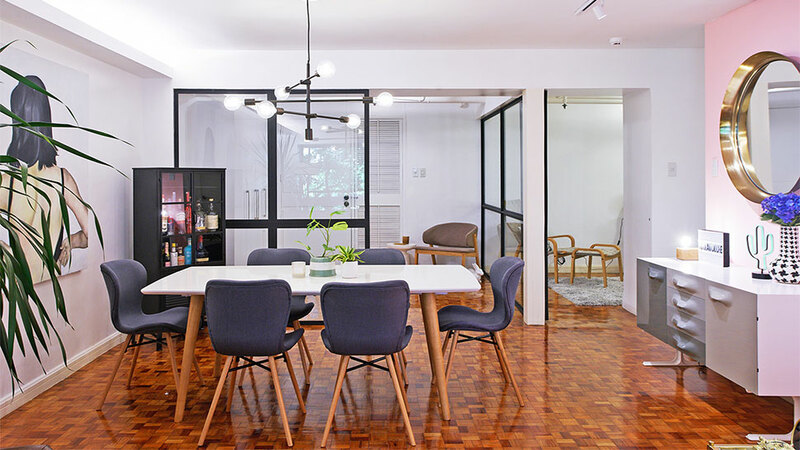 This 139sqm, two-bedroom condo unit had oodles of space, but a couple of trade-offs: it had a low ceiling, and the closed-off spaces were dark and cramped. The couple decided to take the plunge and renovate, tearing down walls and relocating the kitchen to another part of the unit. The end result is an open, free-flowing layout, with more natural light and a view of the trees, and interiors with a playful midcentury Scandinavian vibe.